Lt. Governor Kathy Hochul slammed the former Erie County health inspector who faked dozens of restaurant reports. We asked if the state should have done more to prevent this from happening. 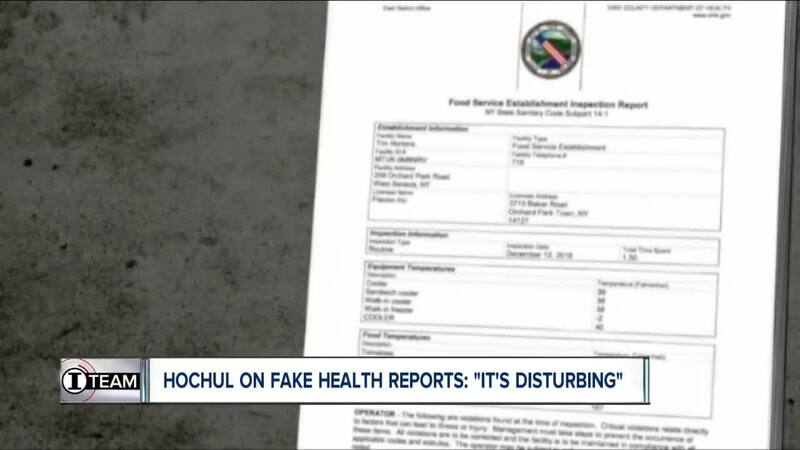 BUFFALO, N.Y. (WKBW) — Weeks after our initial I-Team investigation into a former Erie County Health Inspector , who faked dozens of restaurant reports, Lt.Governor Kathy Hochul is slamming the inspector and his fraudulent reports. Hochul called these fake reports "disturbing." Bean filed at least 25 fake reports between November and December. The Erie County Department of Health thinks this all started in the fall, when his inspection productivity dropped and suddenly spiked. This prompted sweeping changes in the county's health reporting policies. Hochul says everyone still needs to be vigilant. "One would like to think that could happen, but on the other hand we cannot control human behavior. Anyone among our midst, no matter what their role is, whether in politics or an inspector, they can violate the law. The good news is they are caught, there are consequences and there will be greater enforcement going forward," Hochul said. This was in response to our question, if more should have been done by the State to prevent this from happening. Erie County's new procedures are said to be among the strongest in New York State. The Erie County DA is still investigating to see if criminal charges should be filed.